By studying your real and fantasy worlds, you gained a better grounding in facts, rules, opinions, and possibilities. Some of what you learn will probably trigger spontaneous ideas. But what can you do when the words just won’t come? You scheme — come up with a plan of action. The first step is usually brainstorming. The second step is experimentation (which we’ll see tomorrow). Brainstorming is coming up with ideas that share underlying assumptions. These assumption may be about the starting point, ending point, and included characteristics. 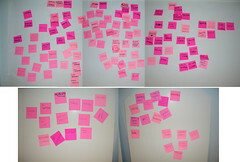 Lists are the most common starting-point for brainstorming. What comes out first will be the most obvious ideas but if you keep brainstorming, you will be forced to come up with more creative ideas. But if you simply can’t seem to think of any new ideas, here are a few tips. Try index cards. I do this when first coming up with characters. Each card has a trait, conflict, or habit. By using cards that don’t repeat, I can create characters that don’t repeat or overlap too much. I can also more easily make heroes and heroines who complement one another. I doubt I could make complete characters from this strategy but it is a useful starting point if you are stuck. And over time your pool of cards will become more diverse. If you like lists, set a ridiculously high (but still doable) minimum for the number of ideas you will generate. The thoughts that appear at the top of the list are what occur to you first. Your reader is probably expecting to see some of these ideas so avoid them. the ideas in the middle of the list probably feel like your best ideas but don’t ignore the ones at the bottom! these were the ones you struggled to create and most may seem pretty impossible. But that means the reader is not expecting them. Look for ways to combine ideas from the bottom with ideas from the middle to surprise your readers. While brainstorming, do not forget to draw on ideas that interest you from the real world. I find salamanders fascinating. I hate racism. So in my fantasy novel I create an enslaved race of modified salamanders left over from a mage war. The heroine must recognize them as intelligent and of intrinsic worth before she decides to free them from their enslaver. This is just a subplot in the book (I don’t believe in hitting people over the head with my personal beliefs) but is an example of how personal interests can generate ideas. Many writers keep a file of articles, pictures, and quotations that catch their eyes. This gives them somewhere to go for ideas while brainstorming. But what do you do with your ideas once you have them? You experiment. That will be covered tomorrow. Posted in Creativity, The Writer.Tagged characters, Creativity, creativity strategies, creativity tips, dragon plume, dragonplume, write what you know, Writers Resources, writing, writing characters, writing strategies, writing tips.